Reporters Tim Fleischer and Lauren Glassberg have more on the tragedy. SHANDANKEN, Ulster County -- Two off-duty NYPD officers were killed in a one-car crash in Ulster County Sunday night -- on the night of one of the officer's wedding. The wreck happened around 11:20 p.m. on Oliveria Road in the town of Shandaken, about a mile away from the reception site. Investigators said Monday it appears they had recently left the party and their car was traveling at an excessive speed. Police say that John M. Martinez was driving the 2018 Maserati when it suddenly left the roadway and hit a large tree, causing the vehicle to flip onto its roof. Photos released by state police showed the vehicle was badly damaged. Scene in Ulster County where 2 off-duty NYPD officers were killed in a one-car crash following a wedding in which one officer was the groom. Michael Colangelo, 31, of Huntington Station and Martinez, 39, of Hauppauge, were pronounced dead at the scene. Colangelo was married for just hours to his bride Katherine Berger, now a widow. 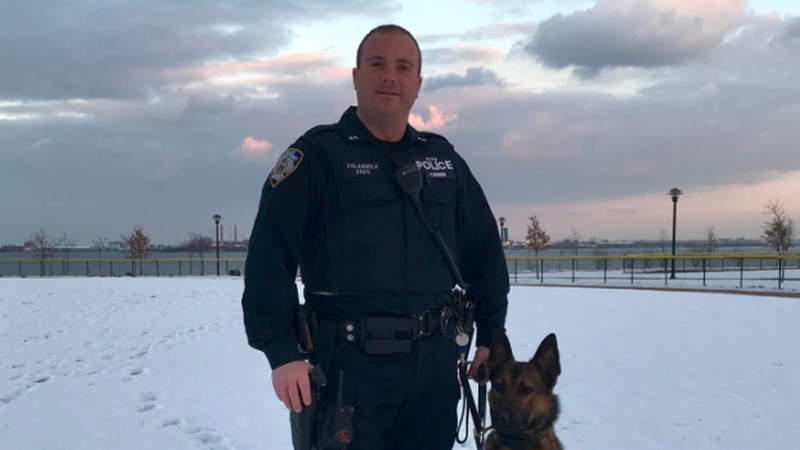 Colangelo, a 10-year veteran, worked as a K-9 unit officer. "I'm shocked, he's a K-9 cop so, you know, he walks his dog around every day, always saying hello to people, 'Hey, how are you? Hey, How are you doing?' If it would snow, I'd do his driveway real quick because he worked 12-hour days, a real good guy, a real shame," Ray Spatafora said. Colangelo and his wife were planning to honeymoon in Costa Rica. Martinez, a 17-year veteran, leaves behind two young children. His coworkers at the 84th Precinct described him as "a wonderful, terrific guy." Black and purple bunting was draped above the precinct house in downtown Brooklyn on Monday in his honor. Reporter Stacey Sager speaks to the families of the victims. A third unidentified person was taken to Albany Medical Center with non-life threatening injuries. Officials said they believe that victim was the only passenger wearing a seatbelt. The cause of the crash is under investigation, but police speculate that excessive speed may have been a factor. "It was a violent impact, obviously, there was rollover involved," said NY State Police Major Pierce Gallagher. "So yes, the speed was probably excessive for that roadway, it's a 40 mph county roadway." The investigation is still in the early stages and authorities are awaiting autopsy and toxicology results.